In order to keep the head from moving during treatment, a box-shaped frame is attached to the head. Pins designed specifically for this purpose fasten the head frame to the skull. The head frame also is a guide to focus the gamma ray beams to the exact location of the lesion being treated. 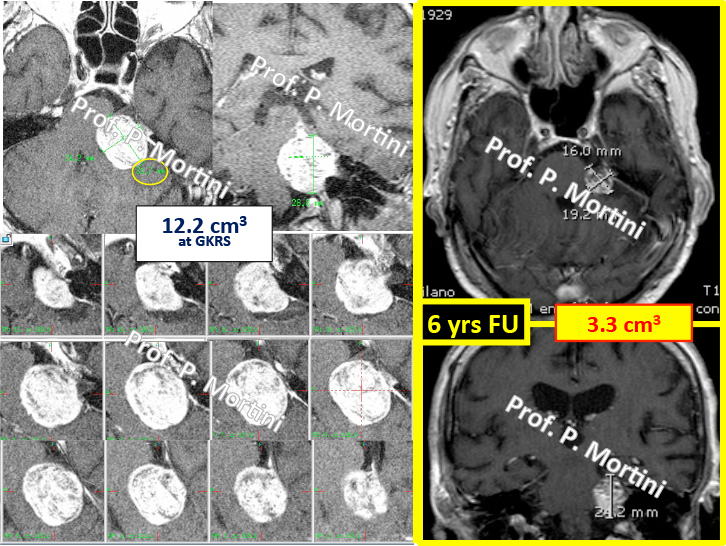 Once the head frame is in place, the exact location of the lesion to be treated will be determined using computed tomography (CT scan) or magnetic resonance imaging (MRI). • radiation dose planningAfter the CT or MRI scan has been completed, the radiation therapy team will determine the treatment plan. The results of the imaging scan, along with other information, will be used by a medical physicist to determine the best treatment. After being positioned for the treatment, a type of helmet with many hundreds of holes in it is placed over the head frame. These holes help to focus the radiation beams on the target. Treatment will last a few minutes up to a few hours, depending on the type and location of the area being treated. Generally, only one treatment session is required for a lesion. A Gamma Knife procedure involves a treatment team approach. The treatment team generally includes a radiation oncologist (a physician specializing in radiation treatment for cancer), a neurosurgeon and/or a neuroradiologist, a radiation therapist, and a registered nurse. In addition, a medical physicist and a dosimetrist work together to calculate the precise number of exposures and beam placement necessary to obtain the radiation dose that is prescribed by the radiation oncologist. Your treatment team may include other healthcare professionals in addition to or in place of those listed here. The Gamma Knife system is one of three types of radiosurgery systems. Gamma Knife systems are cobalt 60 systems, which means they use cobalt as a source for gamma rays. During Gamma Knife treatment, the equipment remains stationary (does not move). Gamma Knife radiosurgery has shown some promise for treating conditions such as tremor and rigidity related to Parkinson’s disease, epilepsy, and chronic pain. There may be other reasons for your physician to recommend Gamma Knife radiosurgery. • Your physician will explain the procedure to you and offer you the opportunity to ask any questions that you might have about the procedure. • You will be asked to sign a consent form that gives your permission to do the procedure. Read the form carefully and ask questions if something is not clear. • In addition to a complete medical history, your physician may perform a complete physical examination to ensure you are in good health before undergoing the procedure. You may undergo blood tests or other diagnostic tests. • Notify your physician if you are sensitive to or are allergic to any medications, latex, tape, contrast dyes, iodine, shellfish, or anesthetic agents (local and general). • Notify your physician of all medications (prescription and over-the-counter) and supplements that you are taking. • Notify your physician if you have a history of bleeding disorders or if you are taking any anticoagulant (blood-thinning) medications, aspirin, or other medications that affect blood clotting. It may be necessary for you to stop these medications prior to the procedure. • Notify your physician if you have any type of implant(s), such as a pacemaker and/or implantable defibrillator, artificial heart valve, surgical clips for a brain aneurysm, implanted medications pump, chemotherapy port, nerve stimulators, eye or ear implants, stents, coils, or filters. • If you are pregnant or suspect that you are pregnant, you should notify your physician. Women of child-bearing age may be asked to give a urine specimen for pregnancy testing prior to the procedure. • You will be asked to fast for eight hours before the procedure, generally after midnight. • You may be given a special shampoo to wash your hair with the night before or the morning before the procedure. • You may receive a sedative prior to the procedure to help you relax. • The area around the head frame insertion sites may be shaved. • Based upon your medical condition, your physician may request other specific preparation. 1. You will be asked to remove any clothing, jewelry, hairpins, dentures, or other objects that may interfere with the procedure, and will be given a gown to wear. 2. An intravenous (IV) line may be started in the hand or arm in order to give medications and/or fluids during the procedure. 3. The skin on your head will be cleansed at the locations where the pins for the head frame will be placed. 4. A local anesthetic will be injected at the head frame pin insertion sites. Once the anesthetic has taken effect, the head frame will be attached to your head with pins that are inserted into your skull. 5. You may feel some pressure during the placement of the head frame, but this sensation should go away in a few minutes. 6. 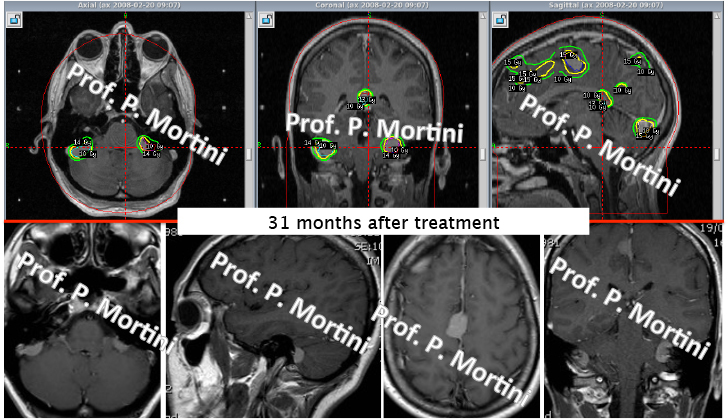 After the head frame is attached, you will undergo brain imaging so that the location of the brain tumor or lesion can be precisely identified for planning the treatment. 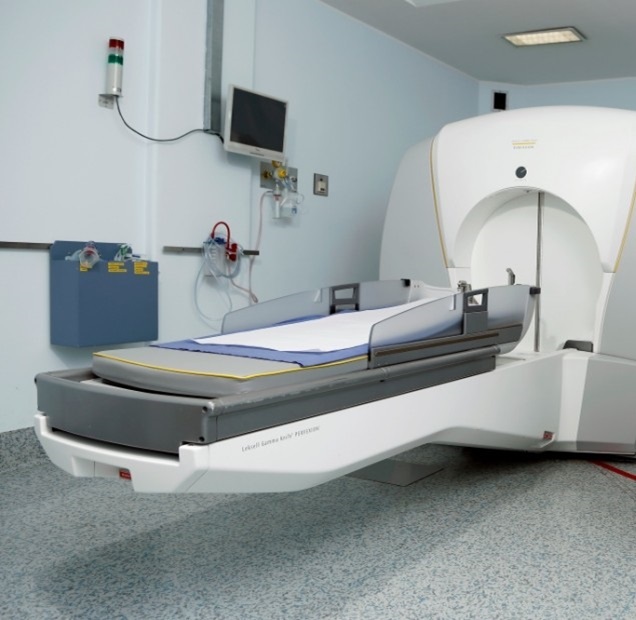 The brain imaging procedure may be a computed tomography (CT) scan, a magnetic resonance imaging (MRI) scan, or a cerebral angiogram. 7. After the brain imaging has been completed, you will be allowed to rest and relax while the treatment team completes your treatment plan. The images from your imaging procedure will be used by a computer in planning your specialized treatment. 8. When your treatment plan is ready, you will be taken into the room where the Gamma Knife equipment is located. You will lie down on a sliding table. A special helmet, called a collimator helmet, will be fitted over the head frame. The collimator helmet has 201 holes in it, which allow radiation beams to pass through it into your brain in a very precise pattern that is determined by a computer. 9. Once the helmet is in place, the table will slide into the Gamma Knife unit. You may hear a clicking sound as the collimator helmet moves into place in the machine. 10. The treatment team will go into another room when the treatment begins. You will have an intercom available to communicate with the treatment team. They will be able to hear you at all times. You will also be observed with a video monitor. 11. The number of treatments will depend on your specific situation. The entire treatment session may last from two to four hours, but the length of the session will depend on the treatment plan designed for you. 12. You will not feel or hear anything from the Gamma Knife unit during the treatment session. 13. After the treatment session is over, the treatment table will slide out of the Gamma Knife machine. You will be allowed to get up at this time, unless you had an angiogram prior to the Gamma Knife procedure. 14. The head frame will be removed. The pin insertion sites will be cleaned and a sterile dressing will be applied.